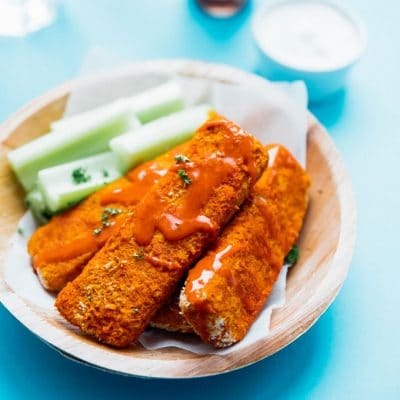 These Buffalo Tempeh Tenders are baked to crispy perfection and slathered in buffalo sauce to make the most addictive vegetarian comfort food! 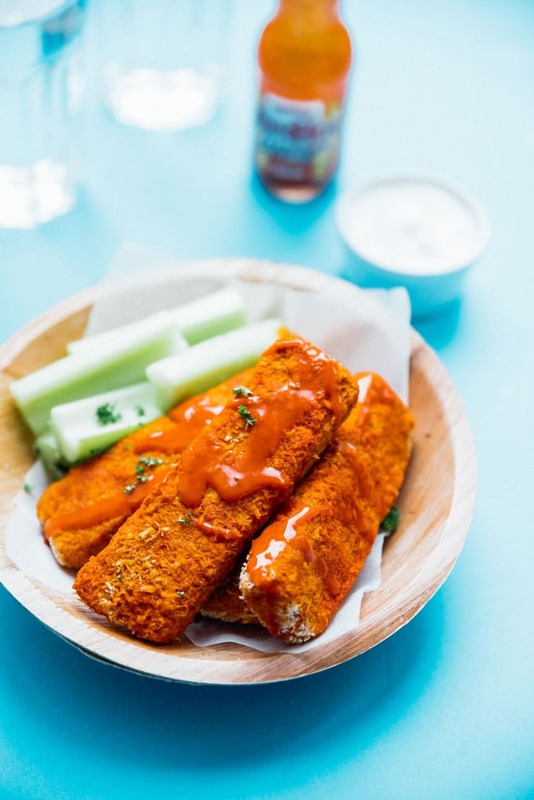 I recently discovered that my little grocery store here in Holland carries Frank’s Buffalo Sauce (granted it’s in the tiniest European-esque bottles). So naturally I’ve been full steam ahead introducing tulip-man to the wonderful world of buffalo sauce. And the next stop on the train to buffalo town? Tempeh tenders! These Buffalo Tempeh Tenders have 3 (THREE!!) layers of buffalo goodness. First we’ll marinate the tenders in buffalo sauce. Then we’ll whisk it in with the egg used to bread them. Then we’ll coat them one more time in buffalo sauce for that gorgeous orange exterior that screams BUFFALO SAUCE IS LIFE. You game? Tempeh: With more taste and texture than tofu, tempeh is a hearty meat alternative. If you’re not a fan of tempeh, you can substitute firm tofu. 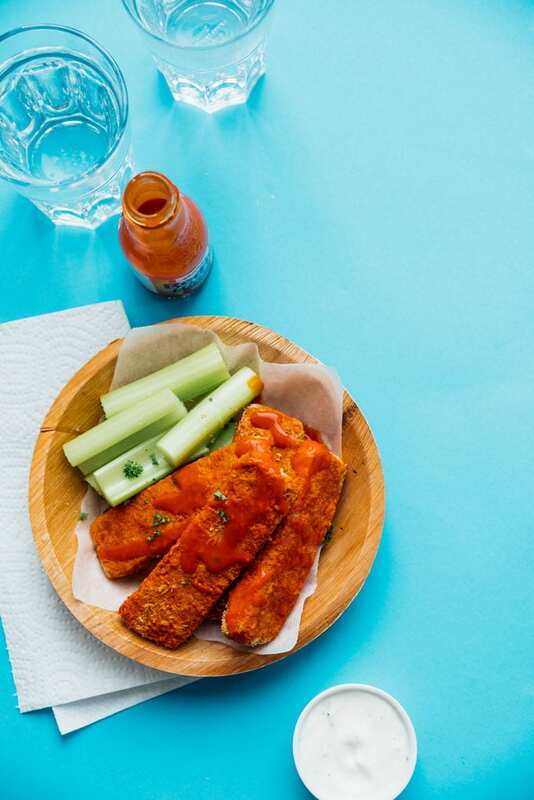 Buffalo sauce: My favorite is Franks RedHot, but you can use whichever you fancy! Breading: We’re baking these tenders rather than frying, meaning we’ll do some basic breading to get them crunchy. You’ll need all-purpose flour, egg (or flax egg for a vegan option), and panko bread crumbs. You can serve these Buffalo Tempeh Tenders by themselves, or as a salad topper, or on a sandwich, or in your weekly meal prep. The possibilities are endless here, friends. Enjoy! 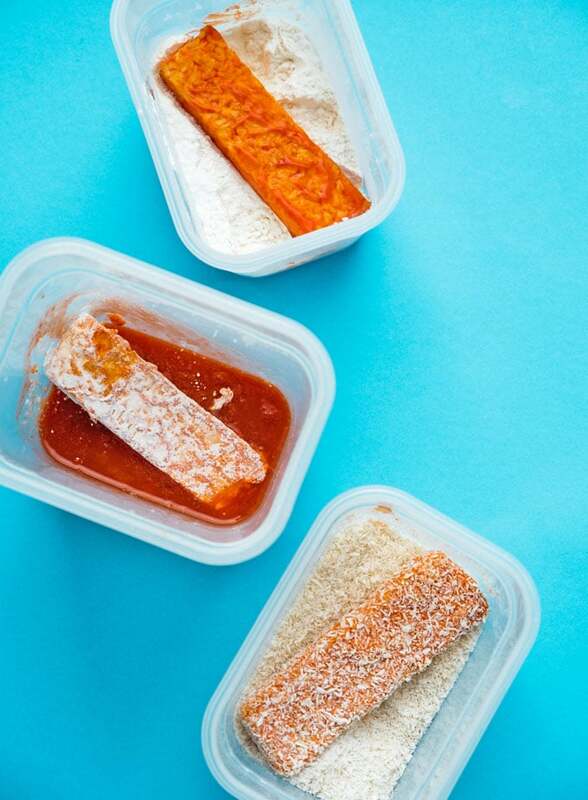 Marinate: Cut tempeh into thin rectangular tenders. If you’re not used to the taste/texture of tempeh, cut them thinner so you’ll get more of the breadcrumb crunch. Set in a deep dish and cover with buffalo sauce, tossing to evenly coat. Let marinate at least 1 hour (or up to 12) in the fridge. Prep: Preheat oven to 375 degrees F (190 C). 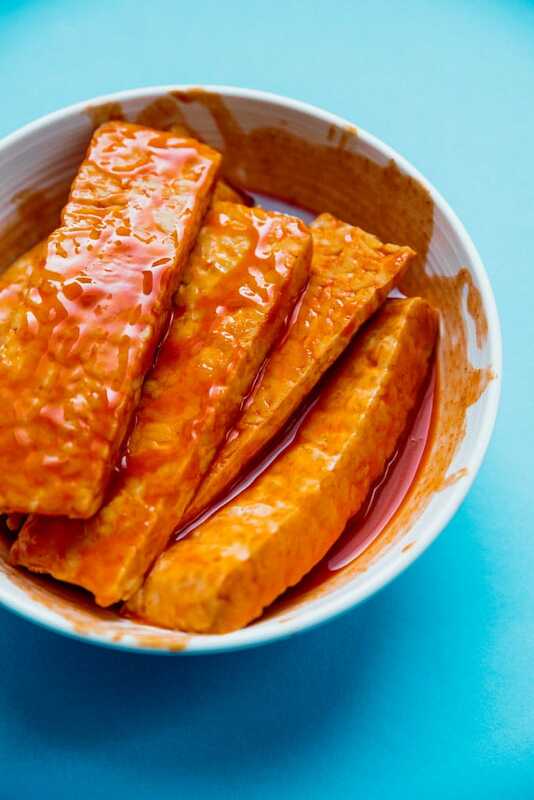 Shake excess sauce from the tempeh and set on a plate, reserving the buffalo sauce marinade. Place flour in one bowl, egg in another, and panko + salt and pepper in the last, with a parchment-lined baking sheet at the end. Add half of the reserved buffalo sauce to the egg and whisk. Bread: Coat each tempeh tender lightly in flour, then egg, then bread crumbs, and set on the baking sheet. Bake: Bake for 10 to 15 minutes, flipping halfway through, until golden brown. Brush each tender with remaining buffalo sauce, then return to the oven for 5 minutes, until slightly dry. Serve: Serve warm with ranch dressing or bleu cheese and celery. *Make this recipe vegan by using flax egg – Combine 1 Tbsp flax seed meal and 2.5 Tbsp water. Let thicken for 10 minutes then use in place of the egg. This post contains affiliate links, which means if you make a purchase after clicking a link, I may earn a small commission (at no extra cost to you). Thanks so much for stopping by and for making easy vegetarian recipes like these Buffalo Tempeh Tenders possible!